...for the atmosphere almost as much as the frozen, sweetened dairy delights. The booths...the counter stools...the 1970s era "menu" of diner food like tuna salad sandwiches on croissants [or whatever]. I don't know about the rest of you, but every time I walk by, those ice cream cookie sandwiches in the window look out at me like a puppy in a pet store desperately seeking adoption. I recommend Hans' to anyone out there who was born in the Vietnam-era or earlier and wants to momentarily re-live a time when retail dessert joints didn't have that Pinkberry, "Irvine Company" slickness to them...but instead were owned by hard-working, grandfatherly men in aprons who churned out homemade treats you truly coveted on special occasions and teenage first-dates. how could you not mention that Hans' is just steps away from our 'other' favorite fish place, Baja Fish Tacos!! Oh wow! I've never heard of this place! We are going there tomorrow to check it out. I grew up in Stanton, and we used to have a Leatherby's across the street from us, they made their ice cream in house it was the best stuff in the world! I can't wait to try this place! We were there for lunch. Had an average Reuben, but the ice cream was GREAT! My family has been getting frozen lemon custard from Hans' since the 1970s. I love Han's.. I havent been there in a while gotta take the family again! Darn, I've been to Baja Fish Tacos a few times but didn't know Hans' was a few doors down.... It's going to be harder now since I've moved north. This comment was like a blog post in and of itself! Great job! Those ice cream sandwiches do look like puppies begging to be taken home. Glad you saw this and you went! What flavor did you try? Avoid the green tea (especially if you've had it elsewhere) and jump at the banana (if it's available). I had a feeling it'd been around for that long. The place doesn't look like it came from the 80s or 90s. Now I have to find out what a frozen lemon custard is. Judging by how long it's been around, it will be there when you both get there! But I do remember the last time I went, the cost was at least a dollar less than it is now. I live nearby Hans', but hadn't tried it myself until recently. Yeah, the banana ice cream does rock. I think I tried the flavor first at Fosselman's in Alhambra, and it was fabulous. It is the first flavor I now look for at ice cream parlors, since it is rarely sold at grocery stores. About an hour ago, I went to Chick-Fil-A [Bristol and Macarthur] to get a free Spicy Chicken Sandwich during Cow Appreciation Week. i have never heard of this place, but another place now to try on my list. btw i looked up strickland's menu and will be checking it out this week. dole whip ftw! Banana ice cream sounds great to me. I like anything banana. But green tea with peppermint flavor? Never had heard that before, and that doesn't sound like a very good combo. You'd think it's be a no-brainer. I mean, banana split? Why not more banana ice cream? I wish that Hans had a website to give us what flavors are available on a particular day. I'd set a calendar alarm for the banana days! It's been a while since I've tried Fossellman's too! 72? Have they been in that location since then? Had no idea! That makes it only one year younger than the City of Irvine. (Trivia you probably didn't need to know, but there you go). 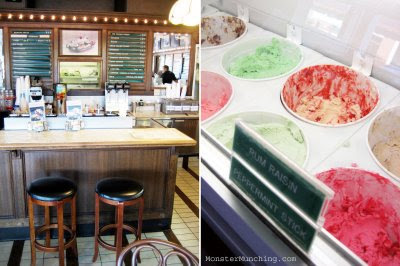 Strickland's is, hands down, my favorite ice cream parlor. They keep it simple. Four flavors at the most at all times, all freshly made. Keeps the customers guessing too. I can't be sure of it, but I think they were going for another type of green tea, not matcha...but then what green tea has mint in it? Hmm...well, mint is green?! I wish a lot of places would post their daily specials on their websites. That'd be a huge help to me. I really enjoy getting ice cream from here; although, my waist can only handle so much. I'd like to point out that Strickland's will be serving up banana ice cream on July 17th and banana chunk on July 18th according to their calendar: http://www.stricklands.info/plugins/calendar/calendars.cfm?calid=2#. Ditto. To the few that do, I am grateful. Sweet! My calendar's marked! What a way to celebrate the end of the week. 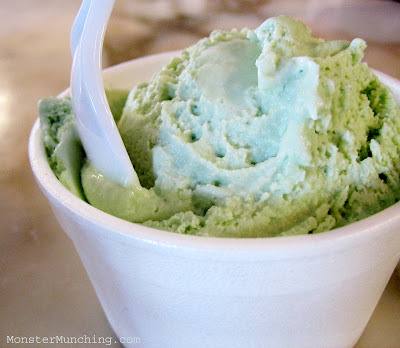 Wow the green tea sounds really strange, possibly they made the ice cream with mint? Oh yeah btw I really like your food blog so I linked your blog on mine.. I hope you can do the same!